You are here: Home » Why don’t the Thunder host a game at Banner Island Ballpark? Why don’t the Thunder host a game at Banner Island Ballpark? Last weekend, the Los Angeles Kings hosted the Anaheim Ducks in a battle of two of the NHL’s top teams. 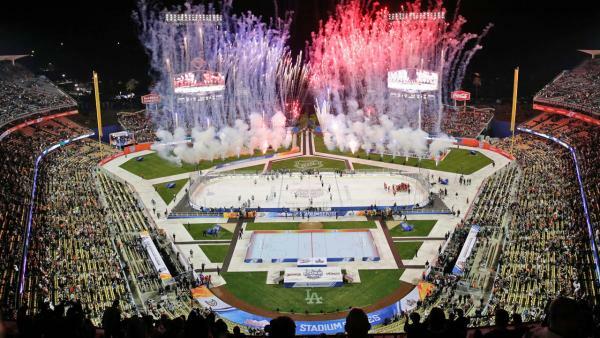 The game itself was not any different than any other regular season hockey match up, except for one detail: the game took place outdoors, at Dodger Stadium, in 70 degree weather. 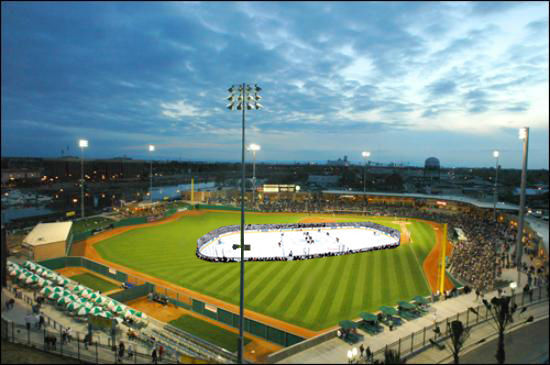 While watching these two teams play under the stars in front of more than 50 thousand fans in shorts and t-shirts, I couldn’t help but wonder, why haven’t the Stockton Thunder hosted an outdoor game at Banner Island Ballpark? Could the Thunder ever host a game outside at Banner Island Ballpark? Sure, hoping for an outdoor Thunder game is a bit of a stretch, but hear me out. The Thunder thrive on creative promotions. Earlier this year, for example, the team played on ice colorfully decorated by kids, something no other professional team has done (most likely). The stunt garnered some very nice press locally and even nationally. And just two weeks ago, the Thunder hosted their annual “Teddy Bear Toss” night, where the over 8,000 fans in attendance showered the ice with stuffed animals for charity after the team’s first goal of the evening. Clearly, the Thunder are not afraid to think outside the box, so how about outside the arena? Stocktonians have shown that they will turn out for unique and engaging events, as evidenced by the Teddy Bear toss and painted ice games at Stockton Arena. An outdoor “Banner Island Classic” would be just as cool, if not cooler. You could make it a whole day event, with local youth hockey teams playing before the actual game, contests, concerts, tailgating, etc, as has been done with other outdoor games around the NHL. In reality, it’s probably way too much hassle to hold a hockey game at Banner Island (how would the Zamboni get out there??). Part of the allure of an outdoor game is the increased seating capacity. Major league ballparks hold 40 to 50 thousand spectators, whereas most arena’s hold only about 20 thousand. In Stockton, the opposite is true. Stockton Arena accommodates around 10 thousand fans, while Banner Island maxes out at just over five thousand seats. So logistically, why would the Thunder go through the hassle of holding a game outside with a lower seating capacity? An outdoor Thunder game probably doesn’t pencil out for the franchise, but for the fans it would be an awesome experience. Imagine the scene: Tailgating in the parking lot beforehand, fans huddled on home run hill or lounging in the Jackson Rancheria back porch taking in a hockey game with the Delta breeze in the background. Banner Island sits idle during the winter, why not make use of it? And if this winter is any indication, rain won’t really be an issue. Good points. What about adding multi-use module features to the ball park allowing for venue conversion to also host other sports on the Ports’ off season, say field hockey, women’s and men’s tennis championships, volleyball championships, soccer, ice-skating (and ice hockey as you have suggested with the Thunders), equestrian polo, regional or state American Kennel Club dog show competition, an annual “Family Fun Doggie Bow-Wow Festival”, wine tasting and food fair with jazz music, monthly farmer’s market, etc. Also, a monthly flee market like they feature at the Rose Bowl, or a monthly swap meet like they feature at the Orange County Fairgrounds could be added to the mix. All of this could also offset costs to help financially sustain the ball park, while attracting visitors to the downtown economy. Just some ideas. I think it’s important to note that BIB has been the site of other events in the past, such as concerts and boxing (I think this happened, but it may have only been proposed). It also hosts other baseball events, but other than these, it appears that the ballpark is generally underutilized in the off season. Good grief, I guess under that circumstance the “National Foghorn Championships” and “Annual Foghorn Music Festival” could be held at BIB.